A company without delighted customers won’t be a company for long. But to orchestrate great customer experiences, you need a solid, comprehensive skillset. CX Certification is a training program that will give you the tools necessary to drive business growth with CX. CX Certification offers a unique blend of hands-on learning and self-paced lessons in an engaging digital learning platform, taught by Forrester experts drawing on more than 20 years of thought leadership. 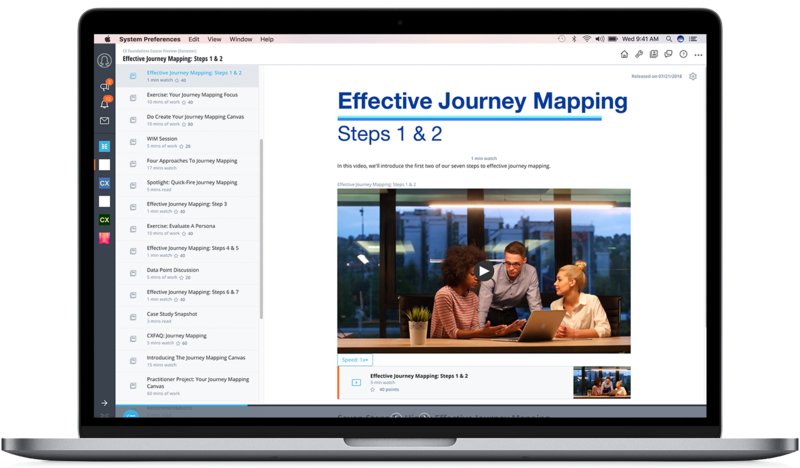 Forrester’s three-part CX Certification begins with a six-week online course in CX Foundations, which features six lessons focusing on topics such as journey mapping, CX measurement, and ROI modeling. Complete the form to start your free trial today. Not ready for a free trial? Learn more about the CX Foundations course. Thank you for your interest in our CX Foundations course. You can now access your CX Foundations course trial on your mobile phone, iPad®, or desktop. We will be in touch with more information about our CX Foundations course and to answer any questions that you may have.